A graduate student, Ian Gray, is researching the evolution of human eyes with Karen and Kenny, in order to discredit creationists by proving that eyes have evolved. Seven years later, when the hospital takes an iris scan of his son and enters into the database, they appear to match with another person’s eyes, which suggested that their son may be some sort of reincarnation of the deceased man. There are some movies that browbeat you and after seeing it, you keep pondering over it. Not because of the excellent computer manipulated images, the brilliant acting of one of the main characters or because of the story ingeniously stuffed with strange twists and surprising revelations. But just because of the concept and the deeper meaning behind the story. And the latter definitely counts for “I Origins” where the thin boundary between science and religion is questioned. In hindsight I thought the title of this film is exceptionally and cleverly made up. If you look at the literal meaning of it, you’ll find out that it reflects the first part of the whole story. Where did I come from? How did I develop as an individual? In contrast when you pronounce the “I”, this will sound like “eye”, which in turn relates to the second part of this film, namely the eye as an organ itself. Now you can interpret this again ambiguous. First of all, the scientific research that Ian performs in regard to the development of the eye in all its aspects. And secondly, there is this saying that our eyes are the windows of the soul. It’s one of the most important senses that humans possess. The gift of sight to observe everything that surrounds us, to let us get enchanted by the beauty of everyday life and which enables us to record things and gain knowledge. They are, as it were, windows on the world. And the most important feature is that every person on earth possesses a unique pair of eyes. Ian (Michael Pitt) is a molecular biologist who’s irrevocable obsessed by the human eye. The entire purpose of his study is to provide evidence that the eye indeed evolved over the centuries. Something that creationists contradict. They stick to the religiously inspired belief that the whole universe arose from a special divine act of creation. The eye is the one sticking point that religious people use to discredit evolution. They use it as proof of an … intelligent designer. Together with the first-year student Karen (Brit Marling), who overenthusiastically throws herself on a parallel line of thought about creating sight on a creature that lacks that despite million of years of evolution, he delivers a groundbreaking discovery. Meanwhile, Ian has met the mysterious Sofi (Astrid Bergès-Frisbey) at a Halloween Party. She possesses a pair of distinct wonderful eyes. This mysterious person becomes Ian’s second obsession and is full of strange and outspoken reasonings. Have you ever met someone who immediately starts telling you the story of the Phasianidae? In his spare time Ian photographes the eyes of certain people. Also those of Sofi, who suddenly disappears out of his life the same evening. He doesn’t realize that this person is going to make him doubt his whole belief system with the concept of reincarnation as central theme. Revealing more about this wonderful film, would be a mortal sin. The best way to experience this film and to let it act on your mind, is by knowing about it as little as possible, like me. I guarantee you that for some it will be an impressive experience and the whole will force you to think about who you are, about your origin and whether spiritual forces exist that affect your human existence. Just as Ian I’m a person who’s faith is only based on tangible and provable arguments. I can not persuade myself to give credence to observations by people who have subsequently written those down thousands of years ago. As Ian says: “These beliefs can not be changed or substantiated by contemporary facts. They are unchangeable”. Could this omniscient and grand higher power exist ? The One who created and controlled everything. Who then again also shows infinite love and wants to take His creatures under his wing ? I can only conclude, if I take the present world into consideration , that He started a part-time job nowadays. 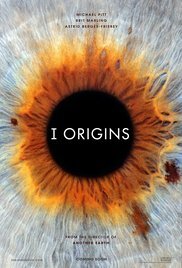 But despite my firm conviction “I Origins” got me pondering about whether or not there exists, without us realizing it, an overarching power that has a profound impact on our void existence. Sofi beautifully phrased it and used strong arguments when she realized what Ian actually tried to achieve in his lab with the blind worms. These creatures aren’t aware of the phenomenon of light. And forcing them to mutate, they would be able to understand the concept of light. The theory she suggests, sounds pretty logical when you think more about it. Could it be possible that individuals exist who are mutated in such a way that they are able to comprehend the spiritual world that surrounds us. A comprehension such as light that surrounds the worms. In all honesty, I am convinced that there is something that is beyond our understanding. Thinking back about my near-death experience, that changed my existence in a drastically way, I came to a point where any logical explanation or science-based plea no longer helps. I can only admit that there’s more than just pure physical life only. The length of a review is to me a measure of how I experienced a movie. A short text usually indicates a meaningless, best-you-forget-it-as-quickly-as-possible movie. A significant volume means that it touched me and that I witnessed something phenomenal. Enumerating film-technical aspects which befell perfectly or glorifying the concise but also appropriate performances, is of secondary importance since the deeper meaning and message dominates. The entire film is laced with beautiful symbolic moments. The way Ian succeeds in finding Sofi because the same figure is appearing again and again, after which he’s confronted with those beautiful eyes staring at him again from a billboard. The conversations between him and Sofi, who obviously has a different perception about religion. The gorgeous equation Ian makes about their failed attempt to get married and the big bang theory, which happened 13.7 billion years ago, when according to him their atoms already clashed together. And the denouement that takes place in Delhi, India : the epicenter when it comes to astral energy and spiritual sensations. It’s no surprise that in the hippie period, many young people flocked to this country to get new impressions and learn about their inner development. All this melted together gave an unsurpassable result with a moving end, that even left me with a lump in my throat. And it was perfectly supported by the sound of Radiohead. Final Conclusion: A brilliant film and truly recommended. It’s surely one that’ll end up in my top list! If you get a chance to watch this gem somewhere, please do so !